We are developing chemical approaches for efficient protein mono- and polyubiquitination. 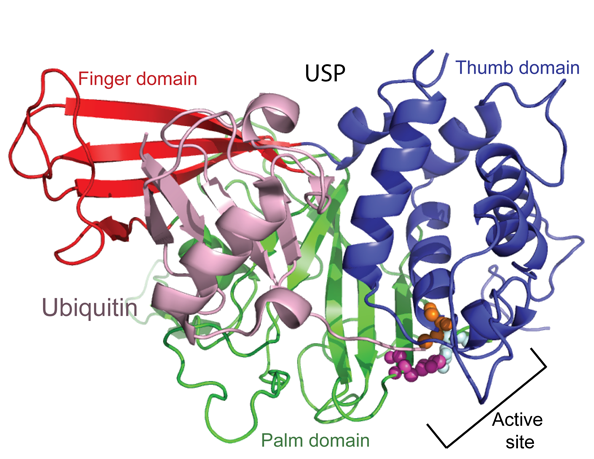 Chemical ubiquitination circumvents the requirement for the ubiquitin cascade enzymes and can be readily generalized for modifying different target proteins. It also allows the generation of homogeneous ubiquitinated proteins with improved yields. However, several challenges for chemical ubiquitination also exist. Lysine residue, the site of ubiquitination, is highly abundant in proteins. Achieving high regioselectivity is thus essential for chemical ubiquitination. Moreover, different from other forms of post-translational modification, ubiquitination utilizes a small protein as modifier. Currently we are exploiting a diverse array of chemistries for site-specific protein ubiquitination. The chemically ubiquitinated proteins serve as probes to understand the molecular mechanism of eukaryotic DNA damage tolerance and other cellular processes that involves ubiquitination and deubiquitination. To study the linkage and target protein specificity of deubiquitinating enzymes, new ubiquitin-based DUB probes are needed. 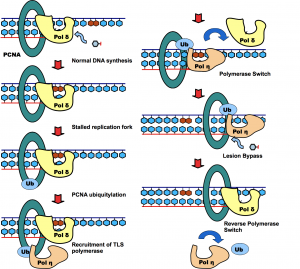 We have developed linkage-specific diubiquitin probes that allowed the interrogation of DUB recognition of different linkages in polyubiquitin chains. The ligation chemistry and linker molecules developed in our lab will allow the construction of new probes that allows the investigation into the target protein specificity and the binding modes of ubiquitin moieties in the distinct DUB ubiquitin-binding sites. DUBs antagonize the activities of ubiquitin ligases. Although the function of most human DUBs remains to be determined, it has become clear that DUB activities are indispensible for the normal functions of ubiquitin-proteasome pathways. Abnormal cellular expression of DUBs or the loss of function due to mutation in certain DUB genes have been linked to various human diseases. We have used high throughput screening to identify DUB inhibitors. The DUB inhibitors were developed and tested in cellular and animal models for anti-cancer therapy. We are developing new assay platforms that allow the efficient screening of DUBs for identification of small molecule inhibitors. The new platform will allow the discovery of more potent and selective DUB inhibitors. Post-translational modification of proteins represents a crucial way of regulating cellular functions. 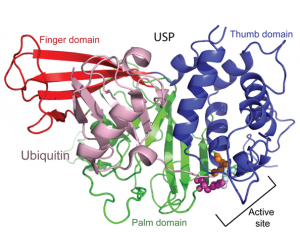 Modification of cellular proteins by ubiquitin and ubiquitin-like proteins plays an essential role in a number of biological processes. New pathways regulated by ubiquitin are being discovered at a fast pace, virtually in almost every important aspect of cell biology, including DNA damage repair/tolerance, signal transduction, transcription, nuclear transport and innate immune response. 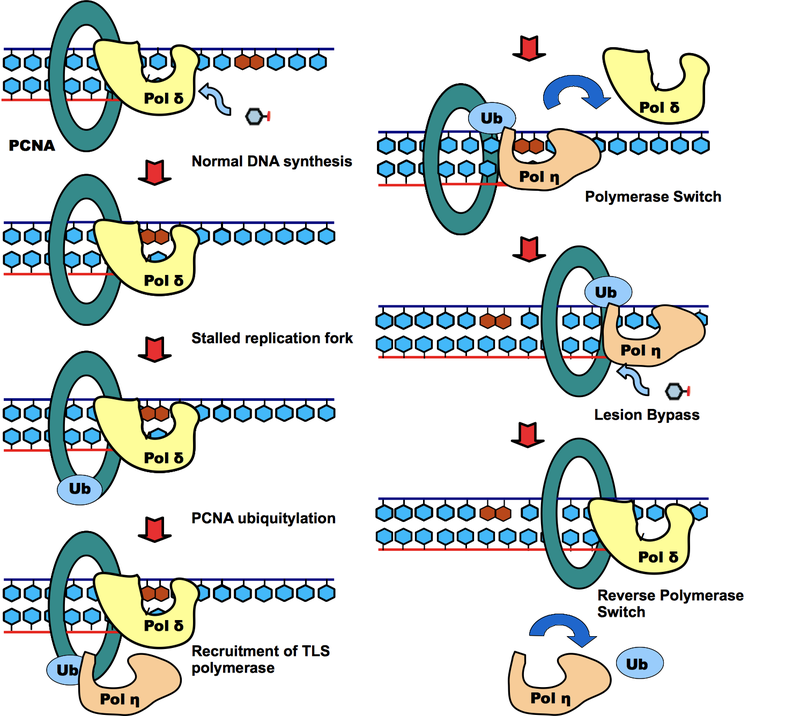 We are investigating the eukaryotic translesion synthesis (TLS) and its regulation by ubiquitylation of proliferating cell nuclear antigen (PCNA). We are interested in deciphering the roles of the protein or protein complexes involved in the DNA damage repair/tolerance pathways, in particular the enzymes responsible for the dynamic process of ubiquitination, as well as the functional outcomes of the post-translational modification by ubiquitin and ubiquitin-like modifier. Our investigations have important impact on human health, particularly, human cancer.